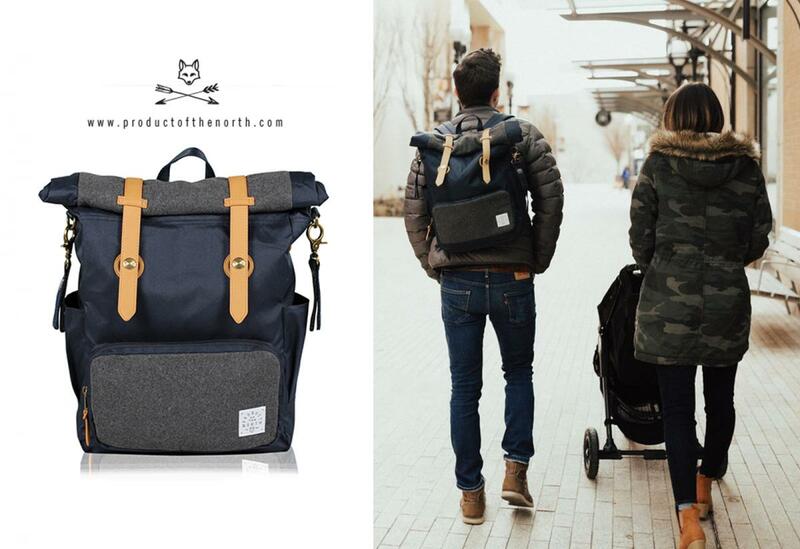 We started Product of the North because when we were on the hunt for a diaper bag we couldn't find anything that fit our style and need. It seemed that everything out there was meant for a woman. We wanted to come up with something that worked for both Mom and Dad. The name Product of the North came from our belief that babies come from heaven and it also correlated with our Pacific Northwest roots. Adam continually mentioned that he wanted to start his own brand, and so I really pushed this idea until it was born. DCS: Product of the North is equal parts Dawn and Adam. What are your respective backgrounds and how do they translate into your role at PotN? Adam: Being that Dawn and I are married we both bring our unique backgrounds to the table to be effective and work together as a partnership/team. Much like being a parent, a partner, and a friend - we negotiate and make the best decisions that we can to be successful. Dawn brings her unique background as an Executive Assistant/Office Manager while also being the personality/face for the brand. All marketing decisions are approved from her while she manages all social media, wholesale order logistics, accounting, and all buyer relationships. I am the designer, creative director, sales manager, cashflow/product manager, and addresses all customer related questions. Overall we both wear a lot of hats and periodically our roles change when needed. DCS: What are some of the benefits and drawbacks of championing your own DIY, independent brand? Well, that's easy. I would say both go hand and hand on all levels. Time and money are the greatest factors in doing something for yourself. With that said, a lot of scarifies and faith go into creating your own path. In the beginning we had to work 2 jobs while also raising two very active kids to lift the weight for this to become a reality. Any entrepreneur will tell you it is the hardest thing you'll ever do, but it will also be the most fulfilling. DCS: Product of the North is a merging of two worlds. Where do you look to for inspiration in style/utility for your products + collections? Adam: Since I'm a designer for many brands, I wanted to collide my worlds into a product that made sense to me as a new parent and a person who is always traveling with a bag. I have taken inspiration from these other worlds and curated them into a product/brand that would feel modernly tasteful without compromising function. In a sense, I just want adults to be themselves; to look and feel amazing in everything that they do and wear. I hope that Product of the North allows them to feel like that. In the beginning when I first built the collection I wanted combine two emotions: a woman's soft touch with a man's rugged hand. This sense of emotion spoke to me when combining the materials we use in our products, and helped me to find that singular music note I wanted to play. DCS: What stage is Product of the North at in its growth and what are you looking forward to on the horizon? Currently we are expanding our colorways and planning to launch a new bag style later in 2019. This new bag has an amazing look that really addresses better functionality from a users point of view, but also has this amazing silhouette that is contagiously authentic and beautiful. We couldn't be more happy with how it is turning out. This product should be launching summer or early fall. In addition, we are expanding our line into the kid's market. As our kids are growing, we want to grow with them, so we have a new bag offering for little kiddos grades K-3. We are expecting these bags to hit the market late spring/early summer - Just in time for back to school. DCS: Where can everyone check out Product of the North? Of course we push our own direct business at ProdutcOfTheNorth.com but we also have some amazing stores throughout the US. One of our most recent new accounts is Nordstrom and we also work with a great registry online retailer babylist. We also sell through some amazing brick-and-mortar stores throughout the PNW. Our favorites are: Poshbaby in Portland, Mysterymade in West Seattle, and Channing Baby in Tacoma. If you are Canadian - good news! We have multiple stores throughout Canada. Some of our favorites are West Coast Kids which has stores throughout western Canada, and Indigo Books which is a huge online specialty retailer based out of Toronto.